Compiled, Copyright and Researched by Glynn Waite. Mansfield to Bolsover Way Bill. Glynn Waite. occasional excursion traffic until at least 1949. Renamed Bolsover Castle 25th September 1950. Used again for excursion traffic between 1977 and 1981.
a person had taken over - Hackett being a good example. From Signalman Brownhills. [** = His replacement took over at Brownhills on 16.04.1891, so he was presumably sent to Bolsover around that time - but not officially appointed for another 8 months!.] Salary £62.8pa. Resigned 16.01.1892. From Relief Porter Kettering. Salary £62.8pa. To SM Watnall. From SM Killamarsh. Salary £70pa. Increased to £80pa 01.08.1894. To SM Darfield. From Clerk Stoke Works. Salary £80pa. Increased to £85pa 01.08.1898. To SM Ullesthorpe. From SM Glapwell. Salary £85pa. To Assistant District Inspector Normanton. From SM Attercliffe Road. Salary £85pa. To SM Worthington (exchange with Dewey). Midland Railway records for individual locations ceased in mid-1908. In 1911 census, single, aged 30, born Kilnhurst, Yorkshire. A boarder with Charles D. Turner at 30 Castle Street, Bolsover. Salary £105pa in 08.1914. Still SM in 1916. Post responsible for goods and mineral traffic only following withdrawal of passenger services. Class 3. Salary £250pa 06.05.1942. Bolsover South Station on a summers day..............Anyone for Cricket. Copyright Unknown. A photograph of Job Frederick Fisher Station Master. This was taken when he was the Station Master at Thurgarton and should be acknowledged to Clive Fisher (his great grandson). Job’s Fisher started as a Porter at Staveley on 11th September 1874, later becoming a Demurrage Porter and Number Taker, also at Staveley. In March 1886 he was appointed to the new post of Foreman Doe Lea Valley Branch, becoming the temporary Station Master at Bolsover when it opened to passenger traffic on 1st September 1890. 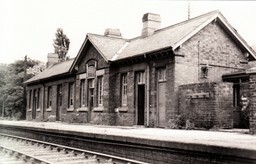 He was officially appointed as the Station Master at Bleasby in June 1891 (having moved there the previous month) and became Station Master Thurgarton in May 1898. He remained in that post until June 1921 when he retired at the age of 65. 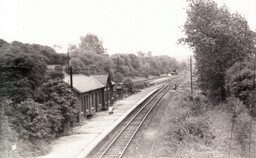 It transpired that five of Job’s sons also worked on the Midland Railway and that the eldest one, Ernest, was at Rowsley from 1931 to 1948, eventually becoming the District Controller. Once again Many Thanks to Glynn Waite.